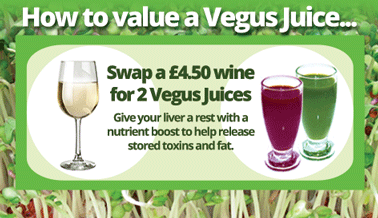 Get a regular supply of juices straight to your front door. Relax knowing you will always have juice to drink. 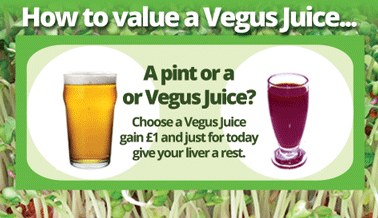 We will continue to send juices to you every 4 weeks until you send us this form. Extra large size for maximum strength. Each tube contains 40ml raw cold-pressed juice. Drink straight from the tube. No fridge required. Take anywhere! 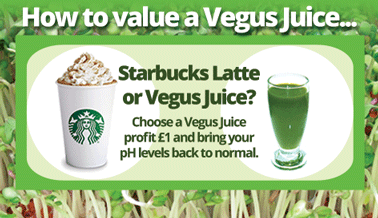 Juices have a 6 month shelf life from the date of production. We normally ship within one month of the production date. We recommend you drink a juice every day. If your health is very compromised you may wish to take more than one tube per day. Please read our Terms & Conditions before you make your purchase, because when you buy any product from this website, you are bound by our Terms & Conditions. 40ml ready-to-drink. Suitable for vegans. Never heated, never frozen, ambient storage. Preserved using HPP-ultra high pressure, 6 months shelf life. 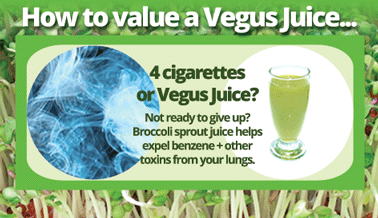 Vegus Foods is the only producer of broccoli sprout juice in the world. 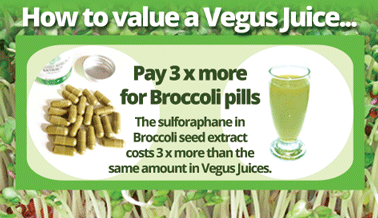 Independent laboratories tested Vegus Foods’ Broccoli Sprout Juice to contain at least 25 micromoles of isothiocyanates including sulforaphane per 10 ml, which means one 40ml tube contains a huge 100 micromoles isothiocyanates including sulforaphane. The Johns Hopkins Institute recommended 40 micromoles sulforaphane a day. How Can I Get Enough Sulforaphane? 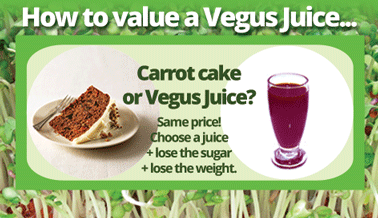 Just one tube of our Broccoli Sprout juice contains 250% of the amount recommended by the Johns Hopkins Institute. There have been more than 1,700 peer reviewed studies on sulforaphane (you will find some of these reports on our website under ‘The Truth’). To find out more about this amazing phytonutrient, please go to our section on sulforaphane. 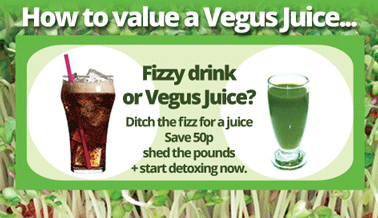 Broccoli Sprout juice contains minerals and vitamins. How Much Broccoli is in One Tube?